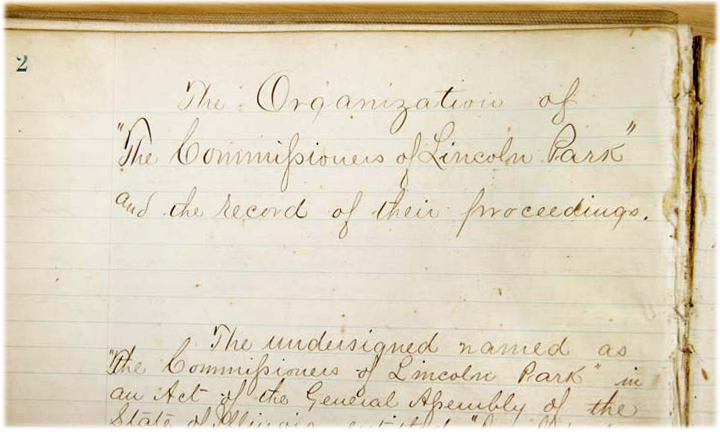 This is the heading on the first page of the first book of the Lincoln Park Commissioners Proceedings. These bound volumes contain the secretary's minutes from each of the commissioners' meetings. 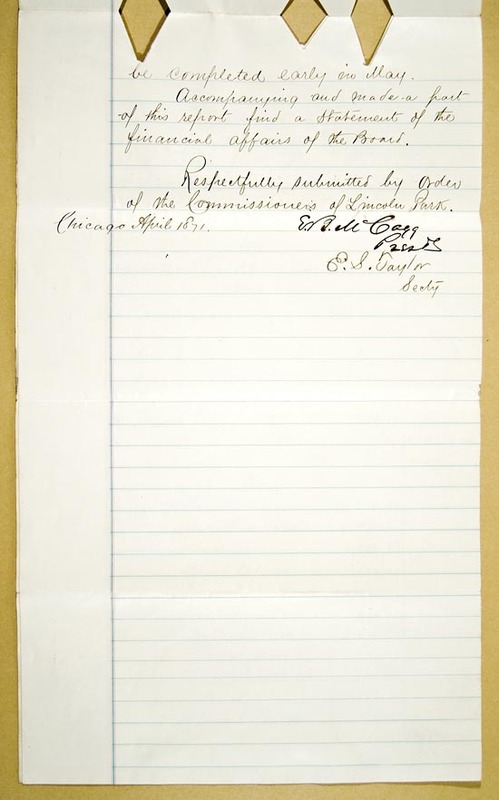 The bottom image shows the signatures of the first Lincoln Park Commissioners. We doubt if the population of the West and South Sides of our city fully appreciate the degree of maturity already obtained by Lincoln Park, or the tide of pleasure-seekers setting toward that delightful breathing-place would be greater. Though less than a fourth of the entire grounds is ornamented or reduced to the approved park style, we cannot say that this circumstance diminishes the interest, beauty or use of the park, especially as a playground for children. The unfinished portion of the grounds formerly, and still in part, occupied by the cemetery furnishes as genial shade, as bracing air, and nearly as agreeable walks and drives as the more finished portion. Eighty acres to the north end have been improved so far to furnish all needed drives, walks, greensward, trees, artificial rowing-ponds, and a considerable eminence as a lookout, which commands a view of the park, the lake and the city. In these respects, this portion of the park may compare in artistic aspect and natural scenic beauty to some parts of the New York Central Park. It lacks the beautiful stone bridges, arches, and other fanciful architectural displays in stone, which give so much attraction to Central Park. But this is in part compensated by the broader prospect afforded by the lake, on which the park fronts for about a mile. Both the graded portion of the park and the former cemetery grounds have as large a growth of trees as Central Park. Both must needs be modest in an umbrageous point of view, when placed in comparison with the century-old trees of Boston Common, or the damp, dank, deep old woods of the newly-opened park at Baltimore. For these great attractions Chicago must indeed wait, but she need not mourn in waiting, for we doubt if, when they have come, though Lincoln Park will be much pleasanter, it will be a more healthy and invigorating resort than now. The cannot well shut out more sun without letting in less of the lake and prairie breezes, the attractions which give this park its chief utility. 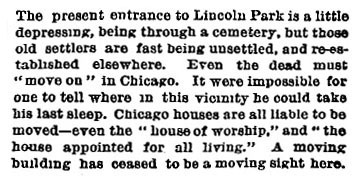 The pleasantest hour, though the least fashionable, for a drive or stroll through Lincoln Park is between five and six o’clock in the morning, when a matinee is given by several thousand choral songsters, which is not advertised in The Tribune, but cannot be equaled at the Opera House. Several thousand persons every day, and from ten to twenty thousand persons on Sunday, already seek recreation in Lincoln Park, and prove how gratefully its facilities for healthful recreation and pure enjoyment are received by the people. But three hundred acres of park will hold a great deal of pleasure, and, great as are the crowds which have hitherto flocked there, we see no reason why it should not attract fifty thousand people at a time during the present summer. Your committee are of the opinion that no general dissatisfaction exists in consequence of any section of the Council in regard to the exchange of cemetery lots. No act of the Council has or could compel the lot owners to vacate their lots against their will, and all that has been done by the committee appointed by the Council to aid in the exchange or purchase of the lots has been in full harmony with the men who owned them. It is not impossible that a few men desiring to speculate in these lots may have considered alternatives a little injured by the act of the Council, passed October 21, 1867, for the purpose of giving the owners of said lots the full benefit of the city’s propositions, but if there are any such we do not know of any medicine or prescription dealt in by corporation that will heal their wounded feelings. 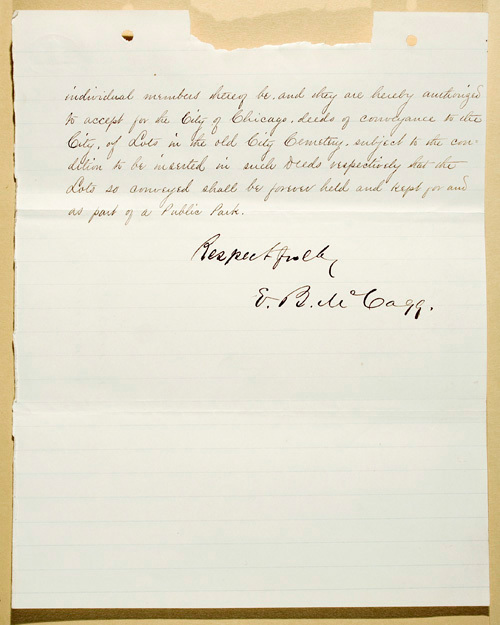 In order that the Council may understand the cause of complaint, we submit the preamble and resolution referred to, as the action of the city, October 21, 1867, which we presume gave rise to the communication of Ald. Holden. As we fail to see any necessity for further action of the Council, we most respectfully recommend that the whole matter may be placed on file. Resolved, That all persons representing themselves as agents to secure the extinguishment of titles are self-appointed, acting without any authority from the city and with the intention of delaying embarrassing and making money out of the city, without securing any benefit whatever to the lot owners, and all good citizens are earnestly requested to discountenance any and all persons so engaged. The report was concurred in. For nearly a year past the extension of Lincoln Park has been arrested by an adverse title of private owners in the Milliman tract, a plat of some twelve acres in the heart of the old cemetery grounds, which is indispensable to give the park symmetrical boundaries and ample room. The desire that this tract shall be included in the park is equally felt by residents in all sections of the city. Many of the petitions to the Common Council favoring the accomplishment of this general object are accompanied by the signatures of South Side and West Side residents, to most of whom Lincoln Park is more accessible than the South and West Side Parks will be. When these additions are made to it, Lincoln Park will contain an area about half as large as the New York Central Park, exclusive of the reservoirs, or about two and a half times its present size. While the enlargement of the park to these dimensions would add largely to the value of property on the North Side, it would add still more largely to the general attractions of a residence in Chicago. Strangers visiting our city know nothing of its nominal division into three sections. They see only one growing metropolis, and they ask, among the first questions, “Have you a park?” The dedication of one or two bare and glaring blocks of vacant space to the public does not answer the demand. The public taste of the country is beginning to understand what a park must be. A lawn, so small that you cannot drive in it ten minutes without meeting the same faces again and again, till they become familiar, is below par. It if is so crowded on holidays that you cannot drive at a trot without running over women and children, it fails to conduce to either public health or pleasure. The present owners of the Milliman tract are the lessees of another tract of real estate in the vicinity, known as the Ira Judd tract, of which the city is the owner. They are desirous of exchanging a portion of the Milliman property for the city property. In the Common council on Wednesday evening, a report was presented favoring the the exchange of the Ira Judd tract of 2 1/2 acres owned by the city for 5 1/2 acres of the Milliman tract, which are needed to form a connection between the present park and the old cemetery grounds. They recommended, however, that it should not be used for the purpose until the Commissioners of Lincoln Park should pay to the city the sum of $60,000, to be divided among the parks in the South and West Divisions. We oppose this huckstering policy altogether. The park when completed, will belong as much to the whole city as the lake tunnel. We venture to affirm that, heretofore, the South and West Sides jointly have furnished more visitors to Lincoln park than the North Side. When the Park attains its full dimensions of 230 acres, we believe that either the West or the South side singly, will furnish more visitors to it than the North Side. It is beneath the dignity of the city of Chicago to make three bites of a cherry of this size. Let the city go on and make the exchange. If there is any surplus due the city, pay it into the general fund. This obviates the objection raised by the Corporation Counsel. It is certainly no objection for obtaining the park for park purposes that, under the act of February 8, 1869, it can only be used for these purposes. There is no desire or motive to use it for any other. We trust that, whatever trifling obstacles stand in the way, our city officers will diligently set about removing them, so as by all means to enlarge and complete the park. It is at present a source of pride as well as of health and pleasure to the whole city. Let it be made all that it can and ought to be. And there is a proposition now before the Common Council to exchange a part of the tract of land belonging to the city, known as the Ira Judd tract, for a portion of the land embraced in the Lincoln Park boundaries, would it not be well for the Common Council, before acting on that matter, to call for this report? (the appraiser’s report) We think it would. And while the Council are about it, would it not be well to see what the Lincoln Park Commissioners have done anyhow? To all appearances they have exhibited just about as much enterprise as Rip Van Winkle’s ghost. To the outside world they have given no signs of vitality whatever, except one of their number buying up a portion of the Milliman tract, which it is now proposed to trade for the Judd tract. Section 9 provides for their causing to be removed from the old cemetery grounds, the dead bodies that may be interred therein. Have they removed any bodies? Not a body. These Commissioners are capites mortui to a man. When a sign is called for they have no sign. They are silent; silent as they will be a hundred years hence. Section 10 provides for laying out a drive two hundred feet in width along the shore of Lake Michigan, from Pine street to the southern limits of the Park. Have they done that? Not one single rod of road has been laid out, and the waters of Lake Michigan sing their lullaby as undisturbed as if the Commissioners were all sunk beneath its waves. Have they obeyed the express provisions of this section? If they have, where is that street? In short, what have those Rip Van Winkles done, anyhow? The people of the North Side would be very glad to behold their acts and doings. We print the report of the Superintendent of the City Cemetery on the subject of the removal of the bodies from the lots in that place. No removals have been made from one-half the lots sold by the city, and of the 25,000 bodies in the Potter’s Field, not one has been removed. The difficulties in the cases of the lot-holders are irremediable by any power possessed by the city, nor do we understand how the city can act in the case of the unknown dead, buried in the Potter’s Field. The cemetery has become anything but a proper place for such a purpose. It is rapidly falling into decay. Something ought to be done in the matter to remove the eye-sore which the cemetery grounds now are. It is understood that the Commissioners of Lincoln Park have the power to condemn this land for park purposes, and, if they have, perhaps that is the clearest and shortest process to apply to the difficulty. If lot-holders will not exchange lots, and will not remove the bodies, then the Commissioners may take the land, making due compensation therefore, and make such disposition of the unclaimed bodies as decency and propriety may suggest. It is stated that some lot-holders cannot be found, and that others are minors, unable to consent to an exchange of lots. However these difficulties may prevent a voluntary surrender of the cemetery lots they cannot prevent the condemnation of the land by the Commissioners for public purposes, nor prevent them taking such proper action with regard to the removal of the bodies as circumstances may require. The Commissioners, however, while they have the power to condemn land, are at present without the power to pay for it – that is, under the Legislation of 1869, no provision was made for taxation. Additional legislation will be required to remedy this defect, and then, possibly, we may have a direct means of disposing of the cemetery troubles. This communication to the Common Council from Lincoln Park Commissioner, E.B. 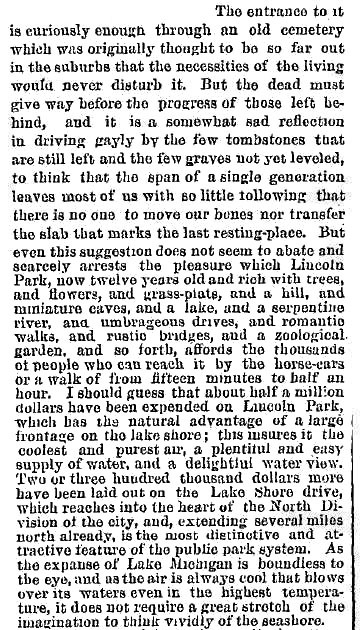 McCagg, suggests that people were willing to donate their cemetery lots to the park commissioners, provided the lots became a part of Lincoln Park. The commissioners accepted the suggestion. All documents on this page, courtesy of the Illinois Regional Archive Depository. 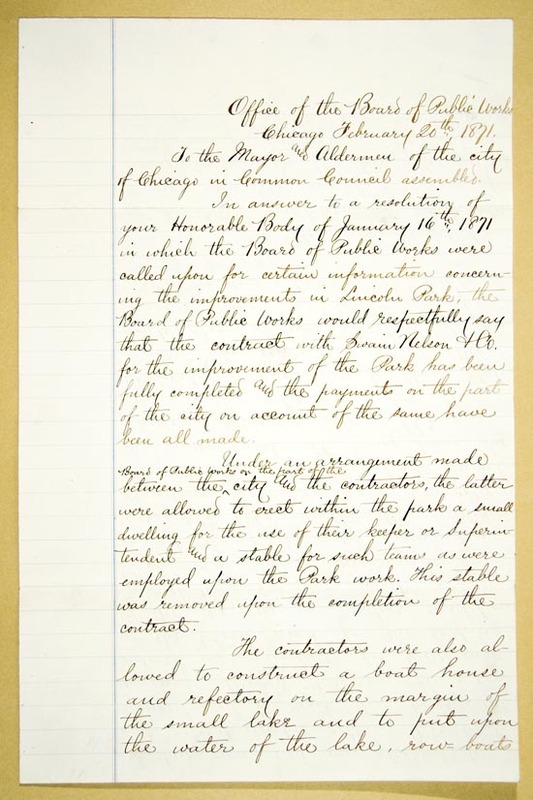 In answer to a resolution of your Honorable Body of January 16th 1871 in which the Board of Public Works were called upon for certain information concerning the improvements in Lincoln Park, the board of Public Works would respectfully say that the contract with Swain Nelson & Co. for the improvement of the Park has been fully completed and the payments on the part of the city on account of the same have been all made. Under an arrangement made between the Board of Public Works on the part of the City and the contractors, the latter were allowed to erect within the park a small dwelling for the use of their keeper or Superintendent and a stable for such teams as were employed upon the Park work. This stable was removed upon the completion of the contract. of their own, and were allowed to sell refreshments within the boathouse and to rent the boats; the revenue derived therefrom being considered an equivalent for their care of the Park, and for the keeping of the ice in a proper condition for skating in the winter season. 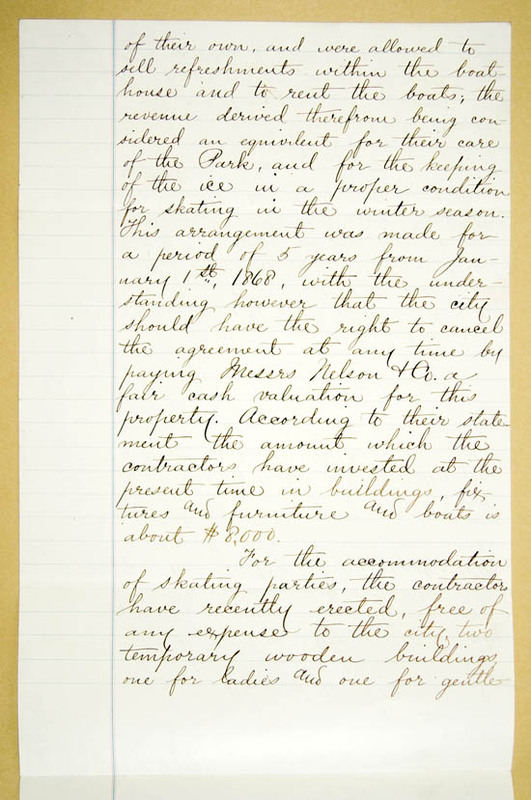 This arrangement was made for a period of 5 years from January 1st, 1868, with the understanding however that the city should have the right to cancel the agreement at any time by paying Messrs Nelson & Co. a fair cash valuation for this property. According to their statement the amount which the contractors have invested at the present time in buildings, fixtures and furniture and boats is about $8,000. For the accommodation of skating parties, the contractors have recently erected, free of any expense to the city, two temporary wooden buildings, one for ladies and one for gentlemen, which they keep heated in a comfortable manner, and to which all are admitted without any charge. There are no booths or peanut-stands within the limits of the Park, and the only places where refreshments are kept are in the boat-house and in the temporary building set apart for gentlemen above referred to. 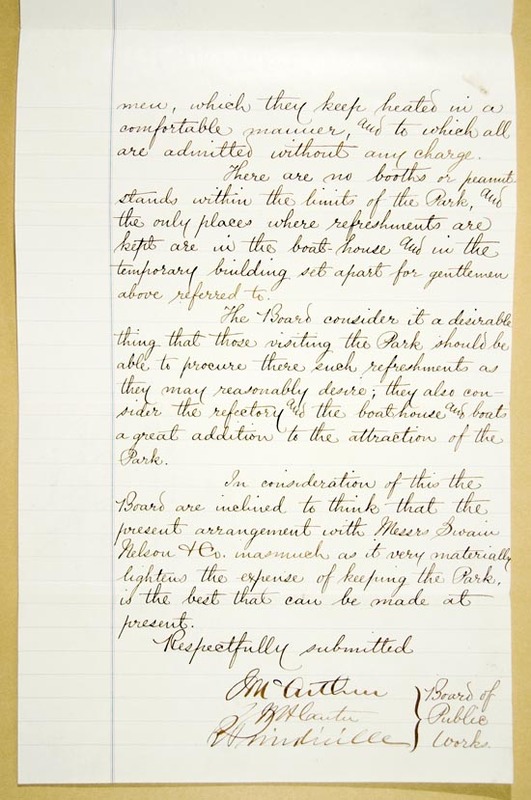 The Board consider it a desirable thing that those visiting the Park should be able to procure there such refreshments as they may reasonable desire; they also consider the refectory and the boathouse and boats a great addition to the attraction of the Park. In consideration of this the Board are inclined to think that the present arrangement with Messrs. Swain Nelson & Co. inasmuch as it very materially lightens the expense of keeping the Park, is the best that can be made at present. 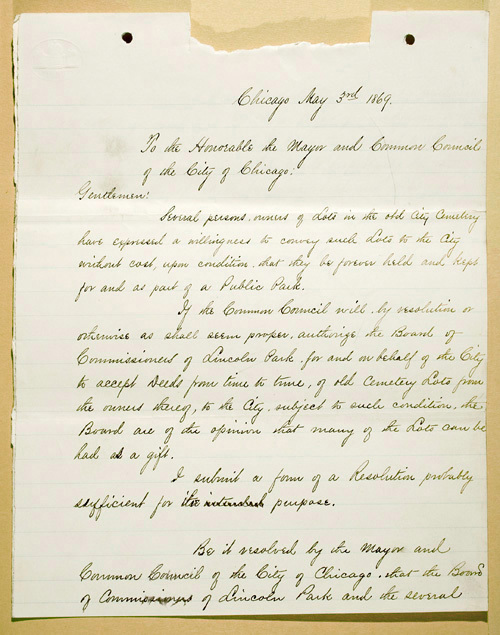 Pursuant to the provisions of an Act of the General Assemble of the State of Illinois, entitled an Act to fix the boundaries of Lincoln Park in the City of Chicago and provide for its improvement, Approved February 8th 1869. 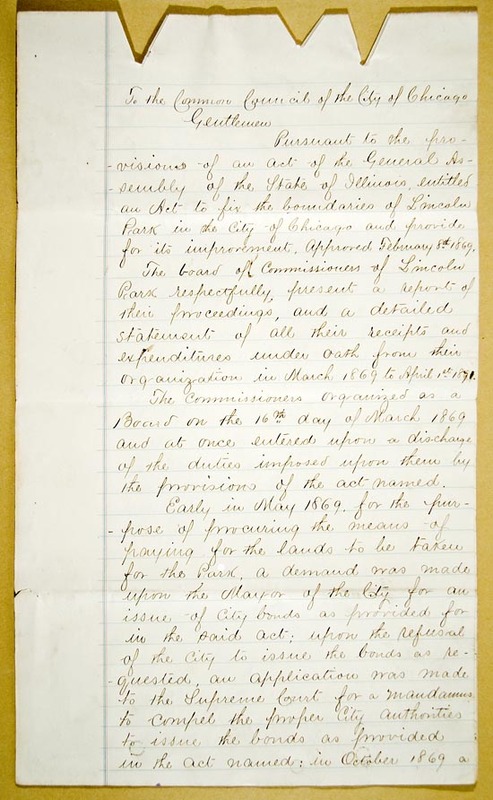 The board of Commissioners of Lincoln Park respectfully, present a report of their proceedings, and a detailed statement of all their receipts and expenditures under Oath from their organization in March 1869 to April 1st 1871. 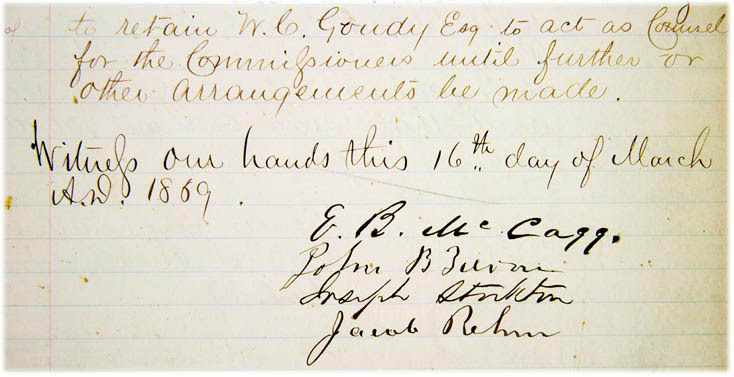 The Commissioners organized as a Board on the 16th day of March 1869 and at once entered upon a discharge of the duties imposed upon them by the provisions of the act named. decision was rendered by the Supreme Court refusing the Writ, thus leaving the Commissioners without the means to pay for the land to be taken for the Park, and arresting the immediate laying out and improvement of the lands to be added to it. 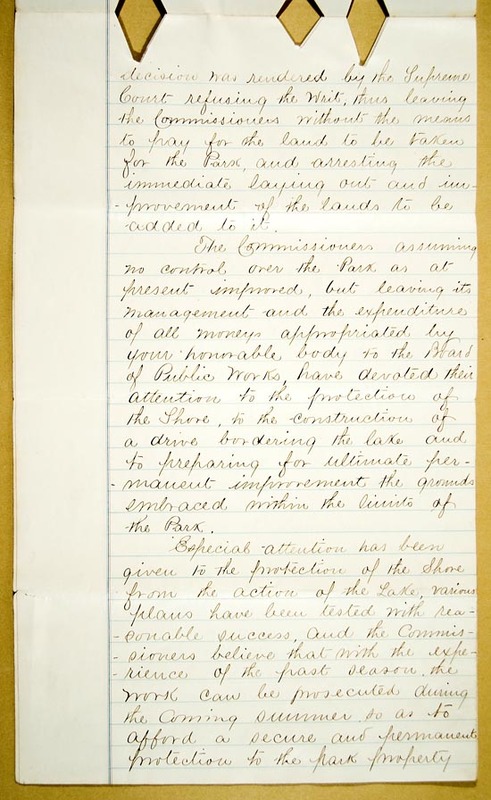 The Commissioners assuming no control over the Park as at present improved, but leaving its management and the expenditure of all moneys appropriated by your honorable body to the Board of Public Works, have devoted their attention to the protection of the Shore, to the construction of a drive bordering the lake and to preparing for ultimate permanent improvement the grounds embraced within the limits of the Park. from further encroachment of the Lake. The Lake Shore Drive (to be extended from the Old Cemetery tract to the north line of the City property) of which one mile and one sixth has already been completed in a most substantial manner, proves to be one of the most attractive features of the Park. 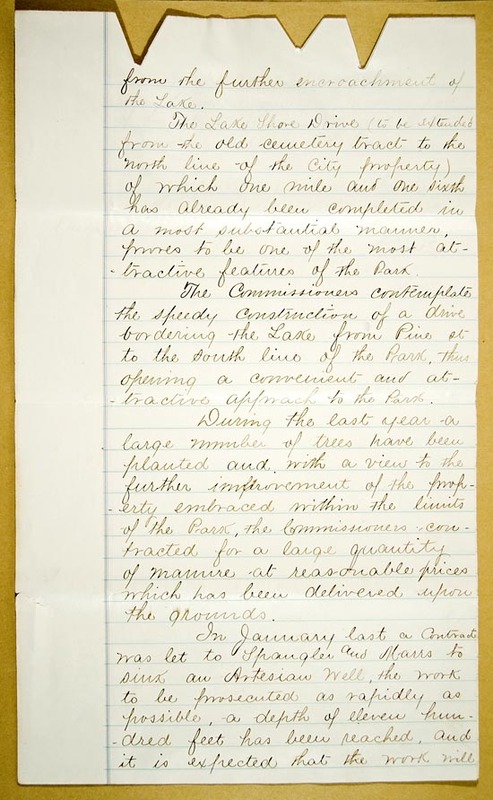 The Commissioners contemplate the speedy construction of a drive bordering the Lake from Pine st. to the South line of the Park, thus opening a convenient and attractive approach to the Park. During the last year a large number of trees have been planted and with a view to the further improvement of the property embraced within the limits of the Park, the Commissioners contracted for a large quantity of manure at reasonable prices which has been delivered upon the grounds. In January last a Contract was let to Spangler and Marrs to sink an Artesian Well, the work to be prosecuted as rapidly as possible, a depth of eleven hundred feet has been reached, and it is expected that the work will be completed early in May. Accompanying and made a part of this report find a statement of the financial affairs of the Board. Respectfully submitted by Order of the Commissioners of Lincoln Park.